The Iranian bomb can be stopped, and in 1,000 days – or so claimed opposition leader and Likud chairman Benjamin Netanyahu in a meeting with some 60 foreign envoys in Tel Aviv on Tuesday. Netanyahu urged the diplomats to take action against the Iranian threat and not sit on the sidelines on the issue, saying that the longer the stick used to bar Iran from developing the bomb, the better the world's chances are of not seeing such a bomb used. When has a world leader openly called for genocide, Netanyahu asked the audience, adding that such a thing goes against the moral principles the world is based on. "The year is 1938 andIran is Germany," said Netanyahu, reiterating his message from last month in Los Angeles. Iran wants a nuclear weapon, he said, but this time the Jews have a country and also a responsibility. My country is threatened, said Netanyahu to the delegates, but so are your countries – Ahmadinejad is a problem for Jews, like Hitler was, but he is also a problem for the entire world. Iran is pursuing a fanatical fantasy of a nuclear armed thousand-year Islamic Reich armed with nuclear weapons, which it will use, said Netanyahu. We must deny them this weapon, he said, you have the power to stop it and it can be done in 1,000 days. Netanyahu's speech comes at the height of a joint US and European effort to pass a UN Security Council resolution regarding the use of sanctions against Iran. Cautious voices of optimism were heard in London, Berlin and Paris on Tuesday following what appears to be a softening of the Russian hard opposition on the subject. However Iranian President Ahmadinejad paid the warnings no heed, vowing on Tuesday that no sanctions wouldl stop the bomb. “A nation whose youth has been able to achieve the nuclear fuel cycle with empty hands - rest assured that it will be able to capture other peaks of (progress),” Ahmadinejad told a large crowd, not long after promising yet again that Israel's days are numbered. 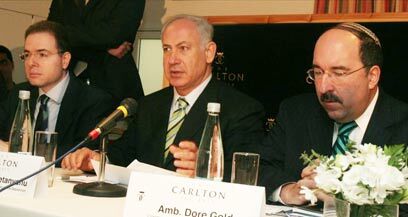 The 1,000 days of which Netanyahu spoke are an apparent reference to the statements made by Mossad Chief Meir Dagan on Monday, according to which an Iranian nuclear weapon is not expected to be completed before 2009. In the meantime US media reports indicate that the Pentagon has already decided to bulk up its forces in the Gulf – for now at least, as a means of deterrence. See all talkbacks "Netanyahu to ambassadors: It's 1938 again, stop Iran"